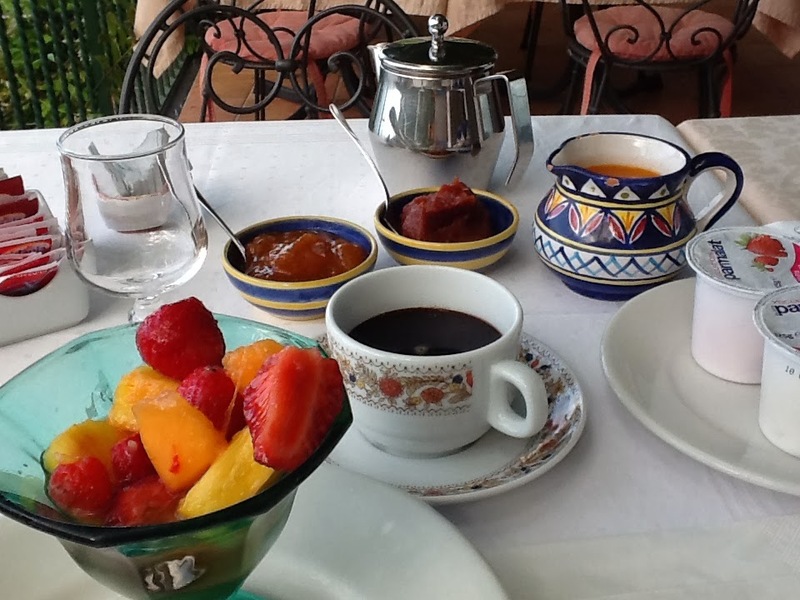 This is the trip report for the second part of my trip to Italy in May, 2013. The first half was with 8 women to Rome, Orvieto, and Florence. To read the trip report for that part, click here. I said goodbye to my traveling companions and boarded the train from Florence to Naples. 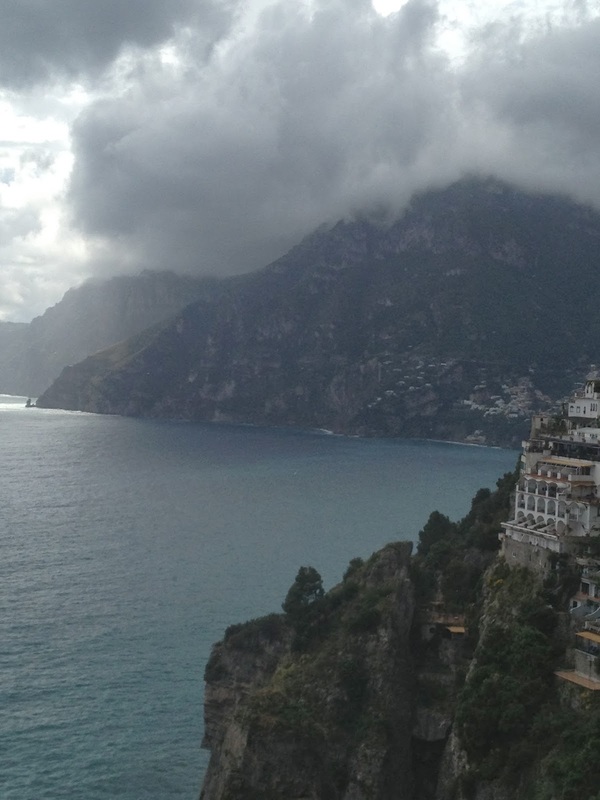 I was going on my first solo adventure—to the Amalfi Coast for a week. I was apprehensive. Everything I had read about the Amalfi Coast said that once you get there it is spectacular, but getting there is a challenge. Train to Naples, go downstairs in the Naples train station to pick up a regional train to Sorrento, and then catch the SITA bus through Positano to Praiano. I selected Praiano as my base instead of Positano or Amalfi for several reasons. Primary reason, cost. 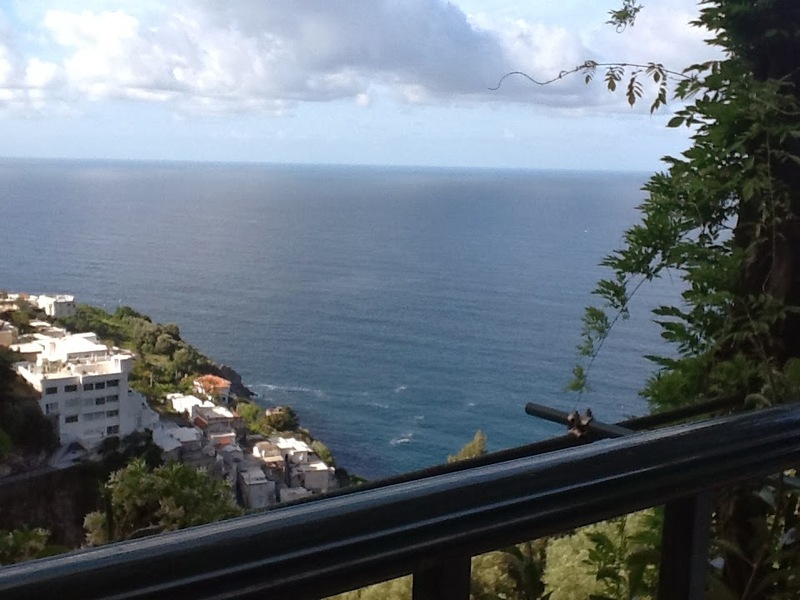 Praiano has the same magnificent views as Positano at half the cost. In addition, I wanted to get away from the crowds and explore the popular areas on my own terms. I didn’t need a night life or numerous fine restaurants. I wanted a charming small hotel or B&B where the staff knew me and would come looking for me if I didn’t return in the evening. After much research, I decided on the Hotel Pellegrino, also called Pellegrino Pensione. Reviewers raved about this little B&B and the owners with such enthusiasm that I knew I couldn’t go wrong. (To read reviews on tripadvisor, click here. http://bit.ly/1600GZF). I sent a reservation request and received confirmation for a single room with a private terrace and a view for 90 Euros. WooHoo! So off I went on the highly enjoyable fast train from Florence to Naples, then bought my ticket for the regional train from Naples to Sorrento. It was dirty, hot, unreliable, and there were kind of scary “thug” looking young men who ignored the no smoking signs. When I arrived in Sorrento, I bought my bus ticket to Praiano at the stand outside of the station. The bus was supposed to leave at 2:30. At 3:00 the waiting, hot, ticket holders were told that the 2:30 bus had broken down, and we would catch the 3:30 bus. I walked down to a market to get some water and use the restroom. When I returned there were twice as many people waiting for the bus. Thank goodness I travel light with just a carry on and a backpack! There is NO WAY I could have gotten on that bus with a full size suitcase. I squeezed in and felt lucky just to be able to stand in the aisle, straddling my carry on. I was in the middle of the bus. 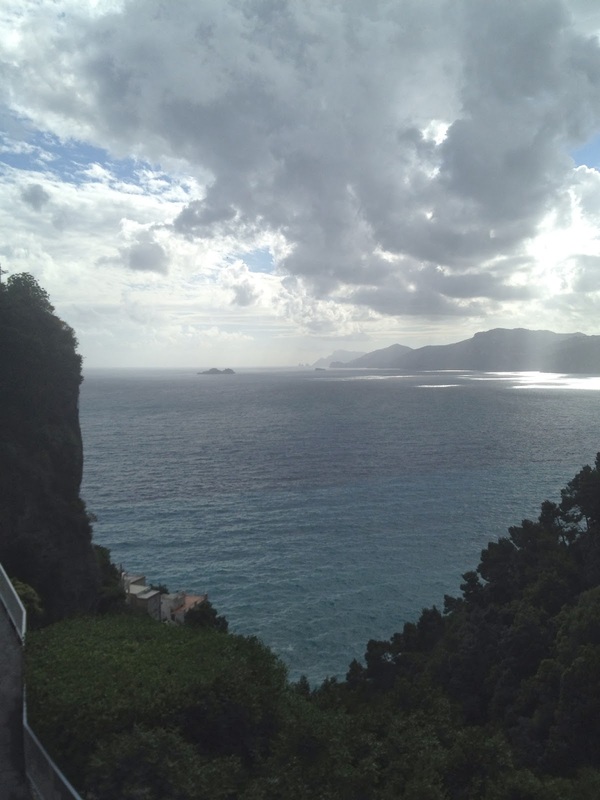 I could barely glimpse the sea as we drove the winding road along the Amalfi Coast. We made a few stops in Positano and even more people got on than got off! I was squished, exhausted, hot, and just wanted to get to my hotel. No wonder people pay hundreds of dollars to have private drivers take them to Positano! Luigi at Hotel Pellegrino had told me to tell the SITA bus driver to stop at bus stop #4 when I get into Praiano. As soon as we passed the Praiano sign, I yelled, “numero quatro!” I knew that was correct in Spanish and I hoped it was the same in Italian. I yelled again, “numero quarto!” We zipped right by the #4 stop and continued along the coastal road, right past the Hotel Pellegrino. Around the bend and into the little village of Praiano, we stopped at the main stop in the middle of town. I got out and dragged my luggage back up the coast road, exhausted and wondering why oh why I had decided to make this trip by myself. Luigi greeted me at the door with a big welcoming smile. I did my best to be cordial, but I was still angry that the bus driver ignored my requests to stop. Plus I could barely breathe from the walk up the hill back to the hotel. Luigi showed me to my room, a rather bare, clean room with a big bed and white walls. The bathroom was small but adequate. Then he pushed back the drapes and opened the doors to the terrace……O-M-G.
First, I was hit with the pungent smell of the blooming jasmine covering the railing. Then, I saw the sea, with the town of Praiano hanging over the sea on the side of the mountain. And as I looked in the other direction, I could see Positano way in the distance. The ferries were like little minnows swimming from one port to the next. It was heaven. Luigi told me to rest, and when I am ready, to come upstairs to the dining room for some of his lemon cake. After ten days of traveling with eight women, and seven hours of challenging travel alone to get to my destination, I was mush. I changed into my comfy yoga pants and tee shirt and went in search of Luigi’s famous lemon cake. Up two flights of stairs to the top floor of the little B&B, I walked into a beautiful dining room of what looked like an elegant restaurant. Tables were set with crisply starched white linens and candles. Outside a terrace ran along the entire length of the dining room overlooking the sea. Classical music played softly. The view was breathtaking. Luigi motioned for me to sit at a table facing the sea. No one else was in the dining room, but it was early, around 5:00-6:00. I don’t drink, but the bar at the end of the room was inviting. What a lovely place to have a glass of wine at the end of a day of sightseeing! I know if my friends were still traveling with me they would be sharing stories at the bar while admiring the view. I declined Luigi’s offer for a glass of wine and asked for hot tea instead. He returned to my table with a nice cup of hot water and tea, and a good sized piece of what looked like some kind of white cream pie. Luigi explained that this is his “lemon cake”, made from lemons of the region. (I soon discovered that “cake” also meant pie.) I asked if he made it and he told me he makes all of the desserts, fresh, every day for his guests. He said that when you come to his hotel, he wants you to have something special, something you can’t get anywhere else. He said, “How will my guests feel special, if they can get the same dessert in Rome?” Then he politely left me to enjoy my tea and “cake” alone. I took a bite of the lemon pie/cake. I can’t even describe it. It was like fresh whipped cream with the slightest hint of lemon and some kind of crumble crust. It was the kind of dessert that makes you close your eyes, it’s that good. 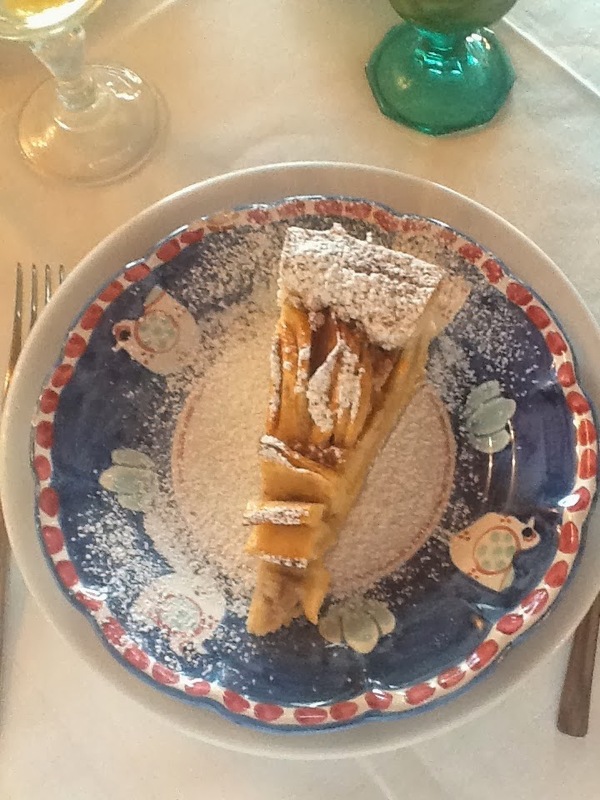 As I looked out at the sea and the town of Praiano, I savored every bite. I took my time. The challenges and stress of getting there faded away. I felt nurtured. I was so grateful that I had selected Hotel Pellegrino with the million dollar view and nice Luigi who made homemade cake every day for his guests. After every morsel of cake was gone, I lingered for over an hour at the table, enjoying the view, the music, the tea, and Luigi’s occasional conversation. He asked me what I wanted to do during my stay. I actually couldn’t tell him. I had been so focused on organizing the first part of my trip with the eight women that I didn’t really do much research on what to see/do while on the Amalfi Coast. 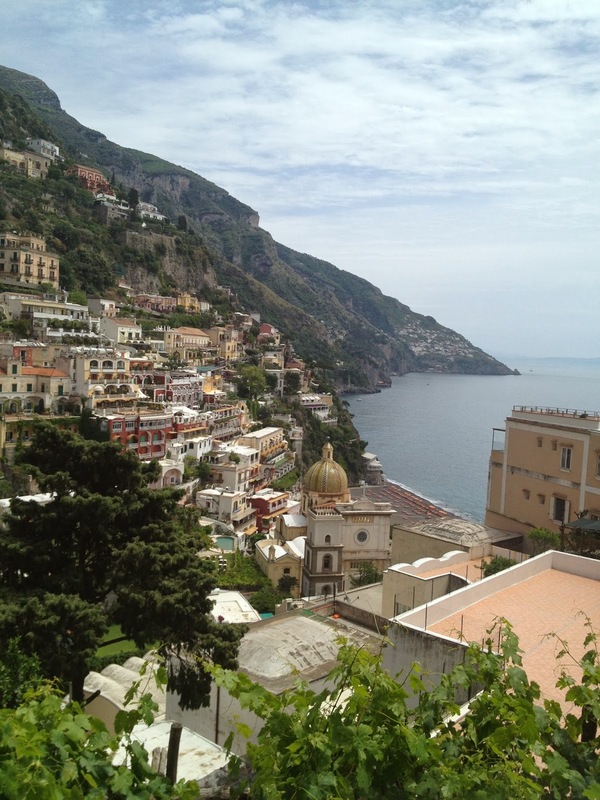 I knew I wanted to spend time in Positano and the town of Amalfi. I knew I wanted to see Capri. And I knew I wanted to rest, eat well, take long walks, and explore the area. Luigi told me that when I want to go to Capri he can arrange a private boat who will take good care of me, or I can take the ferry from Positano. He also said that he sells tickets to the SITA bus that can take me anywhere from Sorrento to Amalfi, and it stops right in front of the Hotel Pellegrino. (Numero quatro!) He said if I want to go to dinner in Positano or anywhere in the town of Praiano, to just call the hotel when I want to come home and he or someone else will come to get me. Also, if the rain clears up and I want to go to the beach, he can take me there and provide towels. I had seen a sign in the elevator when I first arrived that said dinner is offered in the dining room. I asked Luigi and he said they provide dinner every night, just for his guests, and I don’t need to reserve. Just walk upstairs when you are ready to eat, anytime after 7:00 (19:00). There is a 4-5 course menu offered each night for a set price, or I can order ala carte. The fatigue was settling in from my long day and I yearned to go back to my room. I just wanted to stare at the sea on my terrace and then fall asleep reading my book. And that’s exactly what I did. The next morning I was up early and ready for a good breakfast. I always book hotels that provide complimentary breakfast. I am addicted to coffee first thing, so I don’t want to take the time to get dressed and go out to find a café. I must admit that if I read a review that says, “Great coffee!” I give the hotel an extra look. I also have a tendency to skip breakfast, so if it’s provided I will be sure to eat something healthy before I start my day. I am used to the typical B&B breakfast—a table of “help yourself” items, usually breads, some fruit, maybe yogurt and/or cereal. If I’m lucky I can get some protein from a hardboiled egg. I’m really just there for the coffee, so the breakfast is secondary. So again I climbed the stairs to the dining room. It was a beautiful day. I took a table outside on the terrace. I was literally sitting on the side of the mountain overlooking the sea! Spectacular! I could clearly see Positano, perched on the side of the hill, under a bright blue sky. One other couple was sitting in the dining room. Luigi greeted me with his big smile. Before he could say a word, I said, “Coffee. I would just like some coffee for now, thanks.” I looked around for the food tables. Nothing was set out. Soon Luigi returned with a pot of rich Italian coffee. Happily I sat, looking out at the sea, enjoying my coffee. This is exactly what I needed to recover from the challenging travel day I had yesterday. 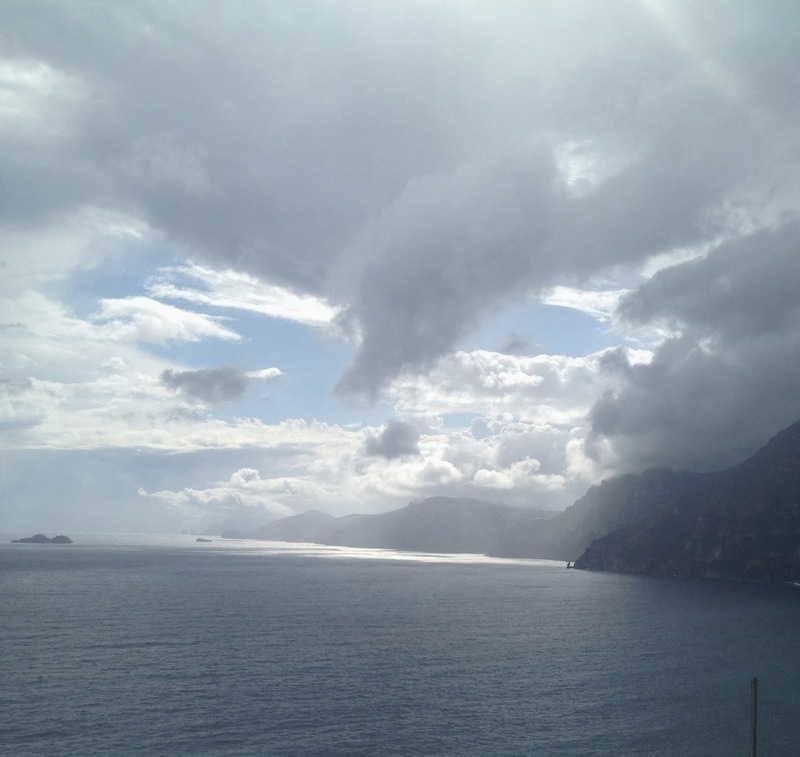 I had finally made it to the Amalfi Coast, and I was so grateful to be here. While I was taking it all in and counting my blessings, Luigi arrived again. This time he quietly placed on my table: bread with an assortment of homemade jams, some kind of fresh juice (mango plus orange? ), and a large fruit cup, all on an assortment of colorful Vietri dinnerware. I was surprised that this was seated service like at a restaurant rather than the self serve table I was accustomed to! Can it get any better than this? Even though I’m not much of a breakfast eater, I ate everything with gusto. I had only eaten the lemon cake for dinner and I was starving. Just as I was finishing, Luigi returned again, this time with a full plate of omelet, ham, and tomato slices! Oh my! Now I started getting nervous. Had I made a mistake? I had reserved six nights at Hotel Pellegrino. There was a discount for every three nights you reserve, so my single room for six nights, including breakfast, was supposed to be 540 euros. 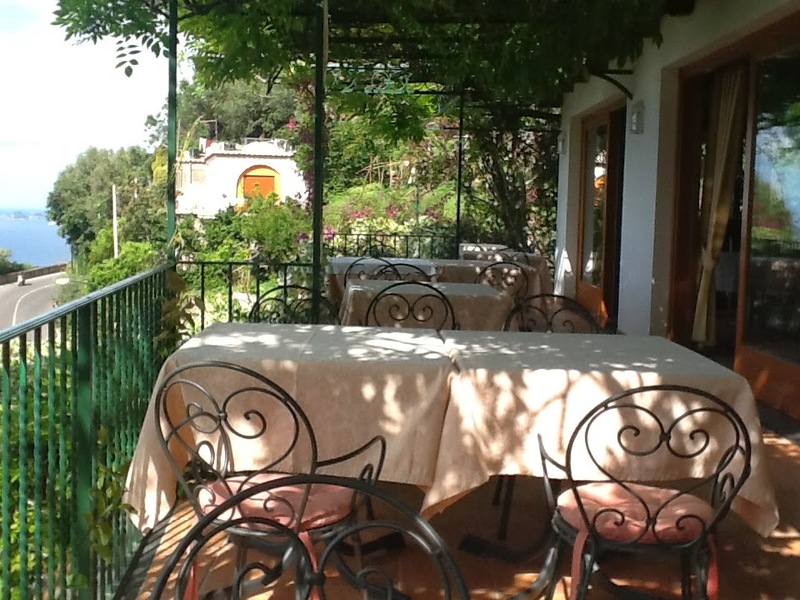 (100 euros per night, with a 10% discount for booking 6 nights) That was 90 euros per night. How could I get a room with a private terrace, and this extensive sit down breakfast, for 90 euros a night? I decided I didn’t care. I was there and I was staying. If I misread the reservation I’ll just pay the extra. This place was exactly what I was hoping for and more! I politely ate all of the breakfast (I wouldn’t want all of that good food to go to waste!). Luigi came over and I could barely speak, I was so full. He asked me where I wanted to go today, and if he could help with any plans. I told him I thought I would just explore the little town of Praiano and get my bearings, then decide what to do next. I had a full six days to do whatever I wanted, and I wanted to take it slowly and enjoy every minute. The view from my room was so beautiful that I could hardly leave the terrace to go out and explore. I honestly could have spent the whole six days just standing at the jasmine covered railing, staring out at the sea. 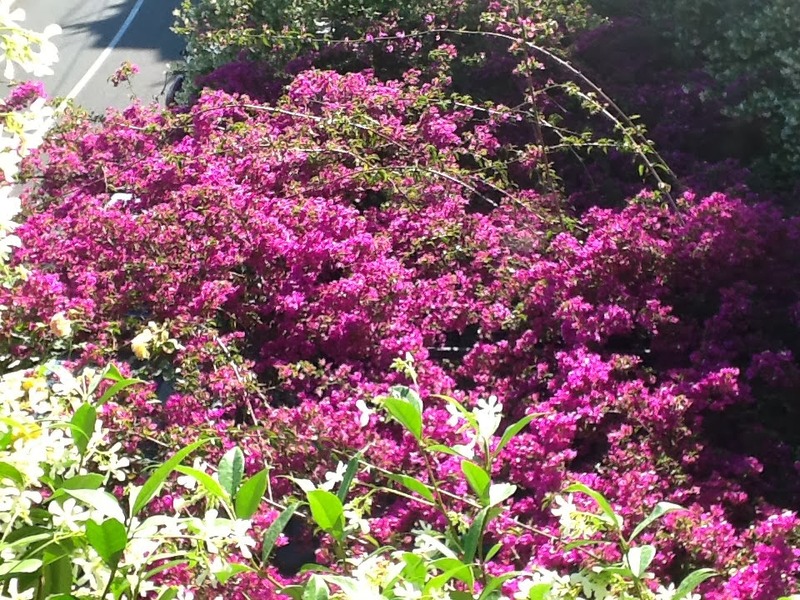 Just past my terrace was the roof of the entrance to the hotel, covered in flowering bougainvillea. 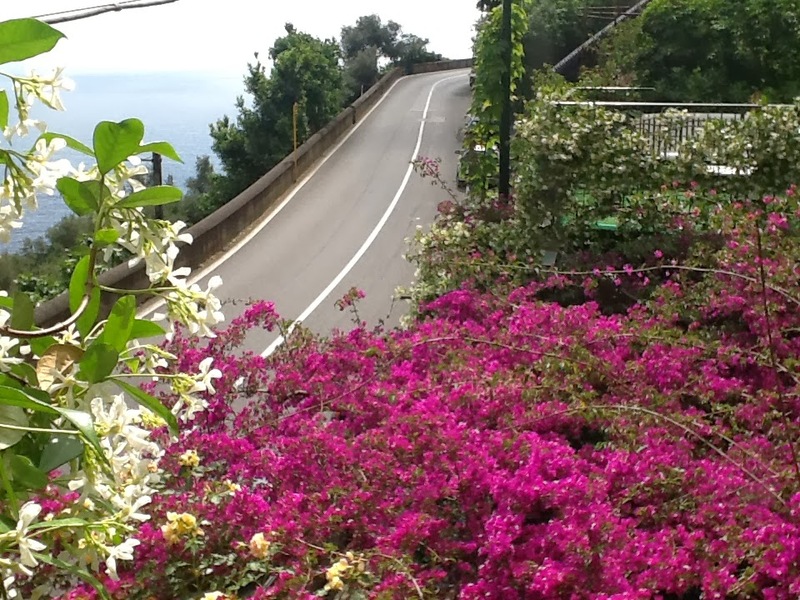 Just below my terrace was the main coastal road that ran from Positano to Amalfi. 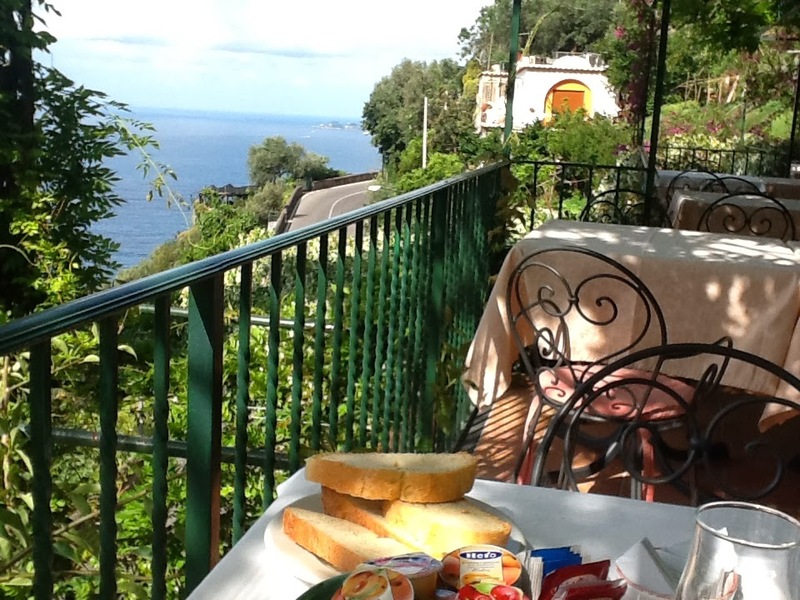 Cars and buses zoomed along the road, past the Hotel Pellegrino, zigzagging their way to either Praiano or Positano. The zooming seemed to be getting louder and louder. My peaceful respite on the terrace was beginning to sound like the Daytona 500. I tried to Skype a friend and the noise was so loud she couldn’t hear me. This will not do! I went down to the lobby to find Luigi. I asked as nicely as I could if there was a quieter room available. He told me there was a very quiet room on the floor above mine that has a much larger terrace that runs along the side of the house. There isn't a view from the room; you have to actually walk across to end of the terrace to see the sea. I asked if I could see the room. We went upstairs. Luigi introduced me to his wife Sandra who was working on that floor. She was every bit as friendly as Luigi but did not speak English as well. They showed me a pristine room with a nice, big remodeled bathroom all done in blue and white tiles. They led me out to the terrace; it was more like a large outdoor porch. At the very end was a railing with the sea view. It was a lot quieter than my room, but I loved the convenience of walking right out to my terrace. Luigi assured me that once I get out of the room during the day, the traffic noise will not bother me. The traffic dies down at night and doesn’t start up until after 9:00 in the morning. I decided to keep my room. During the next few days I came to realize that being right on the main road was a blessing and a curse. The curse was the noise, and when I was in the room during the day I tolerated it. But the many positives far outweighed the one negative. I could walk right outside the door of the hotel and pick up the coastal bus. There weren’t hundreds of steps up or down that I had to walk to get to my hotel. When I walked into Praiano, I just followed the road, no chance of getting lost, no scary back roads to walk at night. I always had spectacular views of the coast whenever I went anywhere. (Note: Luigi told me that unlike in the US, when you walk on the coastal road you always walk on the side closest to the sea). One night when it was pouring, the bar owner where I was having an espresso offered to take me back to my hotel. He was able to drop me right at the door. If you’ve never been to the Amalfi Coast, you probably won’t understand why being located right on the main road was such a positive for me. Since the towns are built vertically, and the incline is very steep, you either have to walk several steps up or down to get anywhere that is not on the main road. Some hotels even have you call when you get to a certain part of the road and then send someone to help you get to the hotel from there! I love walking and am pretty physically active, but I am so glad I didn’t have to feel like I was climbing Mt. Everest every time I went back to my hotel! You can’t go to the Amalfi Coast and not go to Positano, so on my first morning I hopped the SITA bus and took off for the big city. 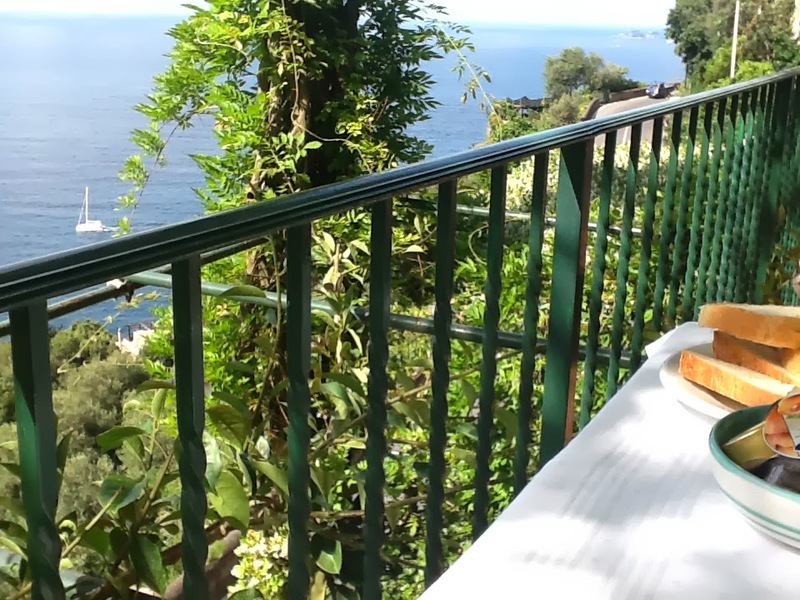 I had selected Praiano over Positano after much research and agonizing, so I wanted to see if I would regret my decision after a day in Positano. I got off at the first stop and walked into town. Now is the time in my trip report when I know I am going to irritate all of those who have fallen in love with Positano. I found it to be very crowded with touristy store after touristy store (how much Vietri dinnerware and white linen shirts can one buy?). I also was disappointed in the architecture. The buildings are not pretty or interesting. Everything is all stacked together so that from afar Positano looks like all of the buildings are connected. I felt very claustrophobic! I have been to Cinque Terre and thought it was much more picturesque. I walked all around, up and down roads and pathways. I walked down to the beach area and up where I saw many of the hotels I had read about. It was only May and the streets were heavily congested with people. I can’t imagine what it must be like in peak season! It was hot that day, and it started to rain. The ferries weren’t running in the rain, so I hurried over to the bus stop. The schedule said the bus should be here in ten minutes. After about 40 minutes, the over crowded bus picked me up. This time I was much more “bus savvy”. I stood in the front next to the driver where he couldn’t avoid me, and I made sure he knew I wanted him to stop at “numero quatro”. And he did. It was a welcome relief to finally return to my hotel. I took a shower, changed, and went up to the dining room for dinner. I didn’t know if I wanted to eat there every night, but it sure was convenient for days like today when I didn’t want to venture out of the hotel again. The dining room was all twinkle lights and soft music. The prix fixe menu looked good, and after asking Luigi about a few items I decided to go with it. Let me tell you…..it was some of the best food I’ve ever had. Seriously. Luigi kept bringing dishes and I kept eating. Everything was incredibly fresh and outstanding. Pasta, a seafood dish, eggplant with cheese, and fresh vegetables. And after all of that, one of Luigi’s famous desserts. All for 35 euros. What a bargain. I ended up eating every dinner except one in the hotel restaurant. Some nights I ordered the prix fixe, other nights I just ordered ala carte, but it was always exceptionally good. Usually there were very few others in the dining room. Luigi seemed to know when to pay attention to me and when to leave me alone, so I felt quite comfortable having dinner by myself. And of course, no matter how full I was, I always had room for homemade dessert! I spent the next few days doing exactly what I wanted. I loved exploring the little town of Praiano, with its friendly restaurants and hotels overlooking the coast. Praiano is a village seemingly unaffected by tourism. The old men gossip with each other on the benches in the middle of town. The little boys play basketball on the court next to the old church. The tiny grocery next to the bus stop sells lemons, apples, toothpaste, and bottled water— whatever you might need. Everyone is very helpful and friendly. My favorite part of Praiano was finding the shore. Since the town is built on the side of the mountain, you must climb down about 500 steps to the sea from the main street in town. 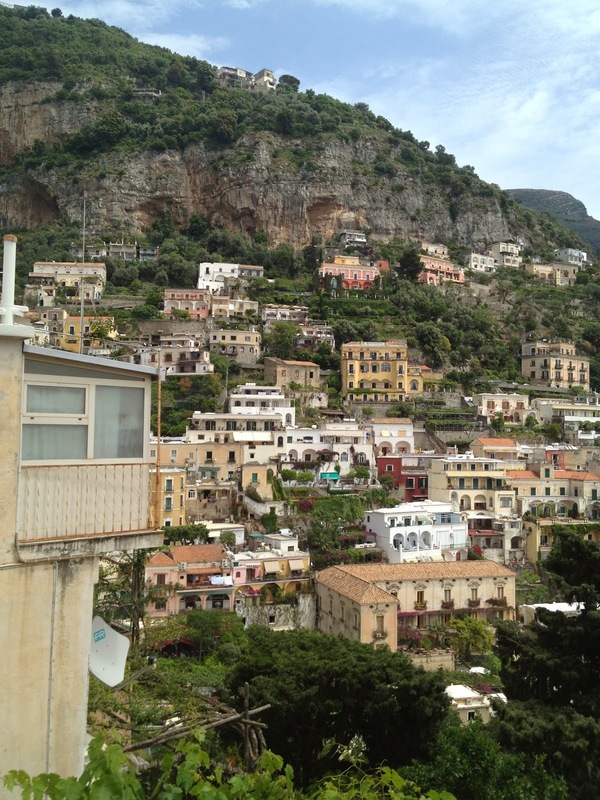 Those 500 steps wind around people’s homes, gardens, and patios, so you get a bird’s eye view of what it is like to actually “live” in a small town right on the Amalfi Coast. When you finally get all the way down to the water’s edge, there is a little restaurant where you can have an espresso or a beer and look out at the wild sea smashing against the rocks. When I was there (end of May) it was unusually cold and rainy, so I wasn’t able to enjoy the “beach”. But I was grateful for the cooler weather while I was climbing back up the 500 steps to town. There are so many interesting places to explore in Praiano, and everywhere I went I was stunned by the views. Walking back to the Hotel Pellegrino at the end of the day I would stop every few feet just to snap a few more pictures. I couldn’t get enough of the views of the sea at dusk, the evening sky with a storm rolling in, and of Positano twinkling in the distance. Breathtaking. The weather was not cooperating with my “bucket list” of things to do and see in the area. Unfortunately, most of the things on my list required clear skies and involved the water. But I was grateful just to be there. I jumped on the SITA bus, this time in the direction of Amalfi. Luigi told me that I should also see Ravello while I was there, so I was ready for a full day of exploring. The bus from Praiano to Amalfi was not crowded and was able to get a window seat on the sea side. There were gorgeous little inlets and coves. I made a mental note to come back to those when (and if) the weather cleared up. The bus pulled into a giant parking lot full of buses right on the water in Amalfi. There were tons of souvenir shops and open air restaurants. Instead of being built on a mountain overlooking the coast like Positano and Praiano, Amalfi is flat. I walked into the main town square, crowded with tourists. Up several stairs was an unusual and beautiful duomo right in the center of town. After exploring Amalfi for a few hours, I was ready to see Ravello. Luigi had told me that I must take a different bus to get there. Before heading back to the parking lot, I stopped to enjoy a gelato and sit at an outdoor table to people watch. Half way through my gelato, the skies opened and it started pouring. I went inside to finish, hoping that this would be a quick little summer storm. I was wrong. Ravello would have to wait. I knew the buses would be crowded so I tied my hood around my neck and ran to find the next bus headed in the direction of Positano. I got the last seat (yea! I don’t have to stand!) next to an attractive lady that looked to be in her sixties. She was Australian and organizes trips and escorts groups of women to Italy. Instead of booking them into hotels, she finds large houses or apartments to rent for the group. While everyone is out doing their thing, she cooks! Wow! Sign me up for that deal! 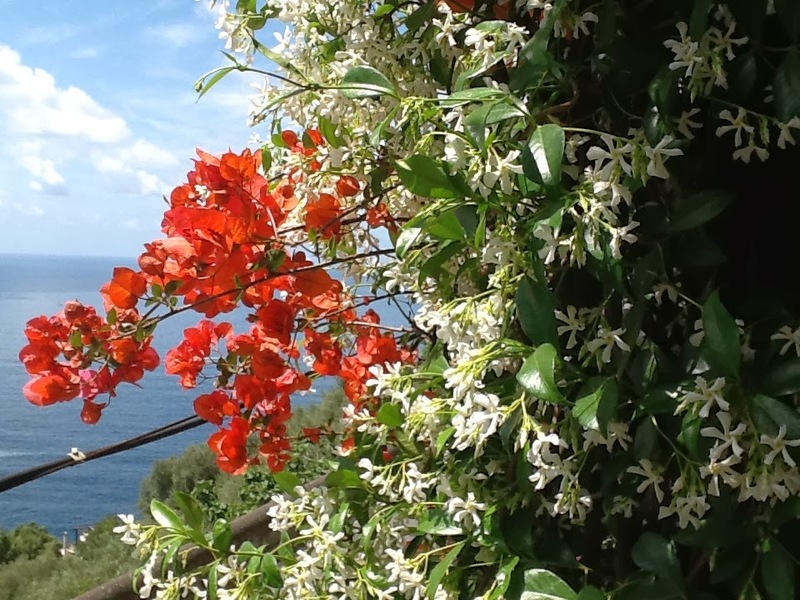 They were staying in a large house she rented between Praiano and Positano. I wanted to know all about her business. I told her I had just spent ten days with seven other women on a trip that I organized. We were all still friends and there was very little drama. She said her trips work out remarkably well, except, she said with a twinkle in her eye, “there is always one who questions everything you do, even though you have spent months researching, preparing and making sure of every detail.” She invited me to join them for dinner at a restaurant about a mile from my hotel. I told her I would love to if it stops raining, but if the storm persists I’m going to stay in the hotel. We said goodbye and I got off at “numero quatro”. I would have loved to join the woman and her group for dinner, but I was “in” for the night. I went upstairs for another amazing dinner in the beautiful dining room overlooking the sea. As it got closer to the end of my stay, I started focusing on how I was going to get back to Rome. I really did not want to go back the way I came—crowded, unreliable SITA bus to Sorrento, icky local commuter train (the Circumvesuviana) to Naples, fast train Naples to Rome. A private driver to Naples for one person was out of the question (way too expensive, at least 100 euro). I looked into going to Salerno and taking the Trenitalia or the new Italotreno train directly to Rome, thus avoiding the local train. But to get to Salerno from Praiano I would have to take two buses. The ferry was not an option because of the rainy weather. Luigi called them for me. We discovered that they would pick me up at my hotel in Praiano and take me directly to either the Naples train station or the Naples airport....for 35 euro!! Yippee! They may pick up other passengers in Positano, but I would be in a clean, air-conditioned van instead of a crowded bus and the local train. Luigi made my reservation and I was all set to go. On my last night I went for one last dinner in the dining room. Again, a spectacular meal. This time Luigi came out with a special dessert. It sounds weird but it was “melon cake”. There was a layer of cake with very thin slices of cantaloupe on top and some kind of light glaze. I had never seen a dessert made out of cantaloupe! It was out of this world! I lingered over dinner, taking in the view and the music and the peaceful atmosphere. 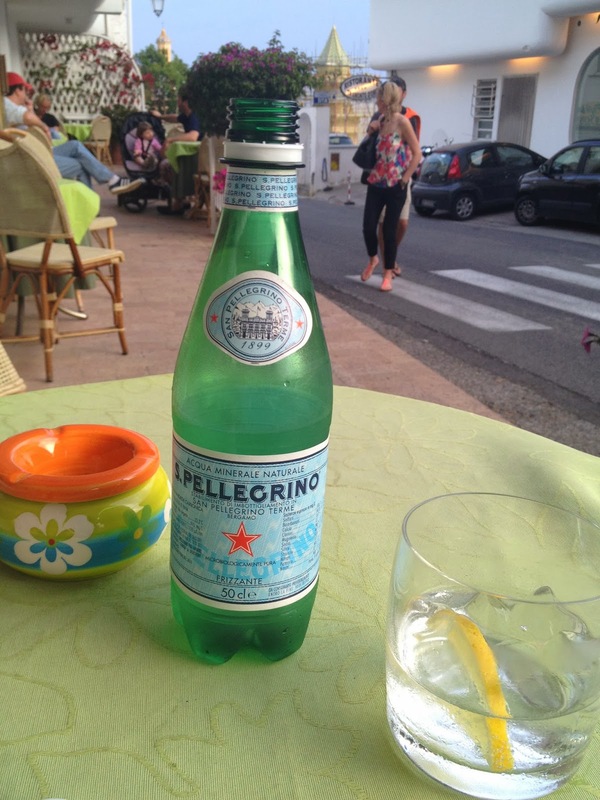 I felt so lucky that I had stumbled on Hotel Pellegrino and Praiano. By this time, Sandra and I were on a “hug” basis. I had met their children and Luigi’s sister who also works at the hotel. I had shared with them my experiences and my observations, and they had showed me what it is like to live and raise a family on the Amalfi Coast. Luigi told me many stories of growing up in the house before it was turned into Pellegrino Pensione. I was disappointed that the weather had prohibited me from doing and seeing many of the things on my list, but my experience was more like visiting family friends than being a tourist. The shuttle was scheduled to pick me up at 9am. After breakfast I took my bags to the lobby. The last thing I had to take care of before I left was my bill. I was afraid to see what this wonderful experience was going to cost. I had trusted Luigi to keep a tab on the dinners I ate in the dining room. (I ended up going to the dining room every night except one). I didn’t bother to look at prices—I just ordered whatever I wanted. In addition, Sandra had offered to do my laundry—a huge help since I was wearing the same clothes over and over. I had a few bottles of water from the refrigerator in my room, and I had bought some bus tickets. So I took a deep breath when Luigi added it all up and handed it to me. Six nights, four dinners, laundry, etc…..631 euros, or $842.00. Amazing. As I was climbing into the shuttle, Sandra came running out for one last goodbye hug. As we drove off on the coastal road, I looked back to see Sandra and Luigi greeting new guests who would soon be enjoying my jasmine covered terrace. The shuttle was great! 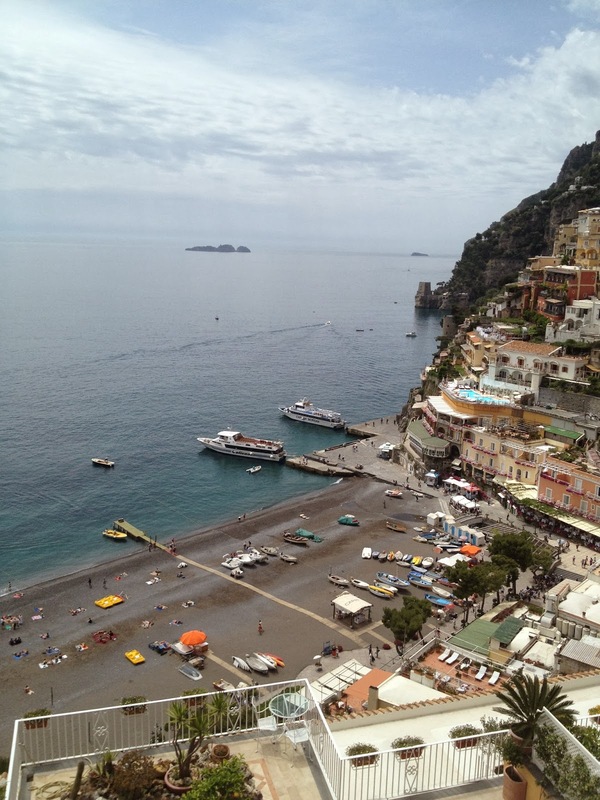 We picked up two couples in Positano and went straight to the Naples train station. Now I know that the next time I go to the Amalfi Coast I don’t have to take the local train and the bus to get to my hotel from Naples. I bought my train ticket at the counter in the Naples station. I tried to use the machine but it insisted I enter a code, and my credit card doesn’t have a code. Oh well. While I was at the machine, trying to figure it out, a small man came up behind me and pushed one of the options on the screen. I took his hand off the machine, threw it down, and yelled, “No!” In an instant he disappeared into thin air! I think he was trying to get me rattled so that he could take my bag, but I was pre-warned that you must be very aware while in the Naples train station. I planned to meet up with one of the women who was on the first part of my trip, and her husband who met her for a week after the “girls” trip. I was anxious to see their hotel and hear all about their adventures. They were staying just down Via Corso from me at the I Tre Moschettieri (http://www.hotelitremoschettieri.com/). I walked down Via Corso to the pharmacy. Next to the pharmacy was a side door and stairs that led to the door of I Tre Moschettieri. My friend greeted me at the door and gave me a tour. It was charming! It looked like an old mansion with beautiful wooden antique furniture. I would definitely stay there. After visiting with my friend and her husband, I had to have one last treat on my last night in Italy…a double scoop of gelato at the gelato place next to the Pantheon. The Pantheon was all lit up and the air was filled with the excitement of travelers. I sat on the fountain and watched the people from all over the world enjoying Rome on a warm summer night. I had been in Italy almost three weeks, and I was ready to go home.